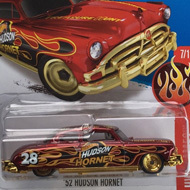 241/250 is 1/5 in the HW Green Speed series and a part of the 2016 Super Treasure Hunt set. The Spectraflame red convertible has black & white graphics on the top of the hood and trunk. 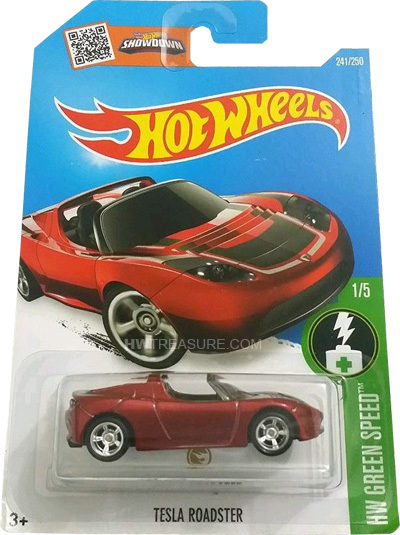 The back of the car has “Tesla”, “TH”, and the Hot Wheels logo on top. It has a black interior, clear windshield, Real Rider 5-Spoke Mag-Style wheels, and a black plastic Malaysia base. The Tesla Roadster made its debut in the 2008 New Models series. It is based upon the battery electric sports car of the same name.